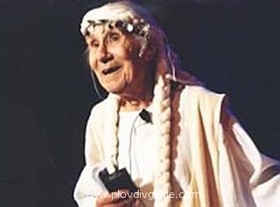 The amous theatre and movie actress Zlatina Todeva was one of the most essential actresses in BG theater and cinema. The actress spent 17 years at the Plovdiv Drama Theater. Todeva, endearingly called by fans and colleagues Mother Zlata, will be remembered for her more than 200 roles, always keeping her abreast of the new trends the theatre and cinema. Among her latest and most memorable appearances are those in "Mila from Mars", "Rhapsody in White" and "The Devil's Tail." "Ihave never been ashamed to play the elderly, ugly or crippled woman. The issue for me was whether the role gives us something to ponder upon," Todeva used to say. She passed away on April 13, 2007, at the age of 81.The funeral was in Plovdiv, at the cemetery where he beloved husband, the great BG actor Nikola Todev, was buried.